All of us are searching hard to find the best credit card with higher reward rate through points or as direct cash back. But we’re missing out some unbelievable offers that are available even on debit cards. Once such card is axis bank’s priority debit card that can easily save you 10% of your spends made online. Let’s dive into the details. So basically you need to spend Rs.25,000 online in a span of 3 months to avail a maximum cashback of Rs. 2500, considering 4 quarters in a year, that’s about Rs.10,000 in savings just for using a DEBIT card. It’s a perfect fit for most of the families who spend about 1Lakh on the card, on quick research I just realized most of my friends are fitting in to this category and they can save 10k very easily. But the downside is the minimum balance that you need to maintain to avail this card. Once you’ve done the purchase, wait for a week or two and then you can claim the offer by clicking the offer page which pops up at the bottom of the screen once you login to the net banking a/c. Its a 2 click process and you get the funds on your linked savings a/c instantly as below. You need to maintain AQB of 2 Lakh to keep this card free. If you’re upgrading your ac from regular savings ac to priority, ask them to issue priority debit card post account upgrade. My account upgrade was a big headache and as it fell under the demonetization days, it went worse. It took them about 2 months to upgrade my ac, but if your planetary positions are good, you may get it done in a week or two. It’s relatively easy to open a new priority ac on other hand. So from the array of debit cards, this is the BEST DEBIT CARD you can ever have in the cashback perspective and next comes the HDFC debit card that gives you 1% cash back on both online/offline spends upto Rs.750 a month. 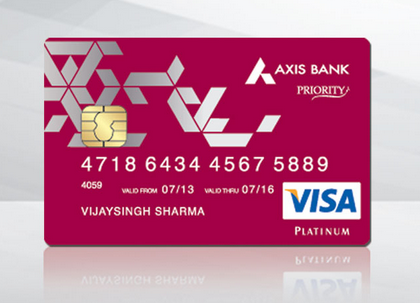 Do you use this axis bank priority debit card? Share your views in comments below. 4 days ago I opened a priority account with Axis Bank. Thanks a lot for this amazing information. As always bank representative has not informed me about this offer. I want Axis credit card so i have opened this account. Should I apply for credit card immediately or should I wait for 6 months ? My annual income is Rs. 3.27 lakhs any my CIBIL is 783. Do some txns for them to enable the CC offer automatically. If its new a/c, yes you need to wait for 6 months to get the card based on txn. You can also get based on ITR. The condition is that 62,500 or more needs to be spent in one single transaction as they have tiered reward structure. And now the best part – you don’t even need to do this spending to earn Rs. 1500 every month. Just pay your any credit card bill using Indus net banking, and choose to pay using your debit card instead of bank account on Indus banking page. Done! IndusInd bank will treat payment as spends on its debit card and will offer you reward points. Yes, i’m availing this every month for about an year. But never know it can be used for credit card bill pay. Anyways i don’t have Indusind CC. Will look into this though. You don’t need IndusInd cc necessarily. Any cc bill (hdfc / stanC/ kotak etc) paid using indusnet, will do good. BillDesk facilitates this. Once you are asked to login to Indus net banking, make sure you pay using the debit card instead of bank account. That’s pretty much awesome trick then! I don’t know if it will work. IndusInd specifically mentions that such transactions by debit card under the netbanking section won’t qualify for IndusMoney Points. Can anyone confirm this? The option of debit card isnt there. I tried doing that. Now the only thing they show is Netbanking. I was thinking of adding money from this card to paytm and than from paytm to bank. I have to do this in multiples of Rs. 5 thousand. Hope it will be considered as online transaction. So I will get cashback in March right ? I can also add my family members to my Priority account and they will also get priority debit card for free. I can get cashback from their accounts also. Yes, technically you will get. Yes, you can add family members as well and get cards for them too. Have you got the cashback for using it in Paytm ? You can load money into payzapp and than you can transfer it to any bank account instantly. This way an AXIS bank priority account holder can easily qualify for online spends and can get 10% cashback quaterly. Can any one suggest Best Debit card or Credit card which offers maximum rewards and I should be able to convert that rewards into Cash directly and maintain less minimum balance in case of savings account like up to 50k average balance. Like similar to HDFC debit card (I am using it right now) which offers 1% cashback irrespective of type of transaction. Hi Sid, I just came across to your website and I am loving it. Just to analyse this offer further, Axis Bank wants you to maintain 2 lac rupees AQB which means that you will be only getting a 4% ROI on the 2 lac locked account. If I compare it to tax free ROI in the market, we are losing 3-4% as an opportunity cost. This equals anywhere between 1500 to 2000 INR per quarter. So, net net, I am only saving 500 to 1000 rupees from this deal per quarter. Now the question is that is it worth maintaining a new account for 2000 to 4000 / year? Transactions made on merchant categories – Mutual Funds, insurance and payment to government will not earn these additional Indus Money points. These points will be capped to a maximum per month limit of 2000 points for Platinum Cards and 3000 points for Signature Cards. All other IndusMoney Terms and conditions of Platinum Card apply. Transactions done via Debit Card under the NetBanking section will not be eligible for IndusMoney points. Yes you are right Thomas. Debit card used for payment via net banking didn’t give me the points. It was actually a parallel transaction which did. @Anil – it was Muthoot gold loan repayment using debit card. Just wondering most of the app based banks allow native account funding via debit cards of other banks. Is that funding treated as transaction, and gets reward points/cashbacks? Can someone testify a use case? how soon we come to whether we earned points or not on particular transactons on Indusind debit card? can we track points on netbanking? Usually it takes 3-4 working days from the transaction date to credit the points. Once credited, you can immediately request redemption which takes another 2-3 days to reflect as money credit. So total lead time is typically a week. This Priority debit card from Axis bank also allows you a free domestic airport Longue access every quarter. which hdfc card you mentioned gives 1%reward ? I am thinking of shifting my salary account to Axis as ICICI is not providing any great benefits. Can priority banking or debit card be provided to salary account holders? Also, can you send me the link for IndusInd debit card which gives INR 1500 cashback per month. I have IndusInd account, just need to request for the debit card. Yes , you can get axis priority debit card for salary account. I have one. Salary should be net above ₹1L/month, only then you can get priority salary account. Otherwise you’ll get prime savings account. Is this Visa or MasterCard. Visa has drastically reduced lounges compared to MasterCard. The one i have is Mastercard. Is this offer still applicable? Thank you. There are multiple priority holders in my family but I only learned of this from to your blog. Unfortunately the RMs seems to be only interested in selling MFs/Insurance and never seems to pass on any useful info. I logged into my NetBanking and despite using the card to top up my PayTM/Amazon for INR 20000, seemingly the offer has not been applied. I guess I will have to go through their useless customer care. It takes 2 weeks approx to reflect. If I add money in any mobile wallet through the debit card, will that also be considered for the cashback ? If I add money for Mutual fund purchase through the debit card, will that also be considered for the cashback ? mutual funds?? Are you sure?? And what about Indusind Debit card >> how soon we come to whether we earned points or not on particular transactons on Indusind debit card? Highly depends on which payment gateway/mode you use to pay. yes, you can track the points. They mentioned this offer is valid till Sep 2017.From when this offer is active. If I open Family account and use family members debit card , are they also eligible for this cashback ? Yes, should be on all cards. No idea from when its active. I filled form for axis priority account & Executive told AQB non maintenance won’t attract any penal charges. 1. Will this impact 2500 Cashback accrual also? 2. Does mutual fund transactions qualify for axis cashback? aqb non maintainance will not attract any penal charge but they have written in small print that account may be shifted to simple savings and if shifted by them , card fees will be billed. Is the offer still running? It looks like the party is over. From 23rd July 2017 I cannot see this cashback offer in net banking. Has anyone noted it ? Anyways I have made more than Rs. 50,000 so far and all thanks to Siddharth. Thanks buddy. 50k? Wow! great Man. Its my pleasure. Yes, it seems to be down now. I made a mistake. It will not be July but June. I have four Priority accounts and they gave cashback lots of time in a quarter. Infact I got cashback 4 times in the month of June alone. I think its a mistake from their end. Has anyone got multiple cashback in the same month ? Seems like the box is gone. I called Axis Bank and they said offer is still active. But I cannot see the box anymore. Can anyone of you confirm with your Relationship Manager about it? P.S. : My relationship manager is on vacation. Hey. I am not seeing this offer anymore in my Priority Internet Banking. Can you see that still? I don’t see it either anymore.. It’s a shame if they took it off without any notice and before the month ends. Even I am not seeing the same from last Friday onwards. Maybe offer stopped. Axis Bank is clearly can’t keep up their offers. Again, Rs. 500+Tax Card from ICICI Bank (talking about Coral Card) is more beneficial as compared to Axis Bank’s 2 Lac + Average Monthly Balance Account. Clearly, Axis Bank is loosing the battle in providing better deals to customer for the value they provide. 2500 Was a good offer. This offer is gone from last 5 days . I last used it on 22nd June. Very sad to see its over now. The offer is still on but there is some bug in the system hence it is down for maintainance . This is the official update given by the RM desk. How can we claim the cashback? Please let me know. Even if I use it, How do I know or where I shall claim the reward? As the option is not coming in the dashboard or anywhere. I’ve no idea as Axis Customer support too is clueless on this. I checked Axis internet banking and it says that 10% cashback offer redemption is temporarily out of service and is expected to be functional by 15th August. everytime i use to redeem 1000 points for 200rs recharge.So its 1000:200 which means actually u have to get 2720 rupess but they have given only 2500.
i think its better to redeem as prepaid recharges time to time to get more value/. If I am unable to maintain the balance of Rs 2 lakh in this account and thus if my account gets downgraded, will I still be able to retain the Priority debit card? Will I still continue to earn the cashback on the same? What are the charges levied for the Priority Debit Card for such downgraded savings account ( from Priority Account)? Anyone got the cashback ? Ho Siddharth it has been a long time since you opened a priority ac. with AXIS Bank. Have you applied for a credit card yet ? Have you got automatic offer ? My priority account is also in its sixth month and I have not got any automatic offer to apply for credit card. What to do ? They’re issuing Privilege card for free to priority A/c Holders since past 2 months. You don’t need t wait, just apply with IT docs. Checked with the customer care, they said the redemption link will be enabled by this month end only ! I opened my account on 24th Feb. 2017 and the branch credit card guy applied my credit card ( through ITR ) on March. Though he was 100% sure of my card approval but my card was denied. Now it has been only 5 months when I last applied. So do you think I should apply again right now throgh ITR ( 4.01 lakhs annual income ) or should I wait for automatic offer to trigger just to be on the safe. My sole purpose of opening the priority account was to get a credit card. I am very nevous now but I trust your judgement 100 %. What do you suggest ? 6 Months cooling period is good. Rejected for privilege or some other card? They might expect high ITR. I don’t recall the name but it was surely not Privilege card. Infact it was a basic card. I am still waiting for you answer . Should I wait for automatic offer or should I apply through ITR after 6 months of cooling period ? Hard to answer in single line. But 4L ITR on basic card afer 6 months cooling period is good to go. Hey Siddarth, How to apply for the Privilege Card? I click on the Apply Now Button and it open contact form. You mean Privilege credit card? Visit Branch. I noticed too. looks like Axis backend team is not so good at solving a simple glitch. Where you are this option??? Hey. Are you receiving transaction alerts in your email box (specifically email) for Axis Bank Savings Account? Where you can see this option? I am not able see this on the app. This offer is back. Now wallet transactions are excluded from transaction. How does one claim redemption for the April-June quarter? Redemptions are supposed to be claimed within the following quarter (i.e. July-September), but the redemption widget was not available for a single day during July-September! Previous quarter is July-September 2017. I am asking about the April-June quarter, which could not be claimed within the July-September quarter because the widget was not working at all for even one day from about 23rd June to 24th October. Customer Service replied that a SMS was sent to all eligible users last week, but I did not get it. They haven’t responded after that. Anyone get the message? Yes. Now wallet loads don’t count. Luckily amazon pay wallet loading is considered as online shopping and getting counted. Hi i got an sms saying i am eligible for cashback april- june quarter. 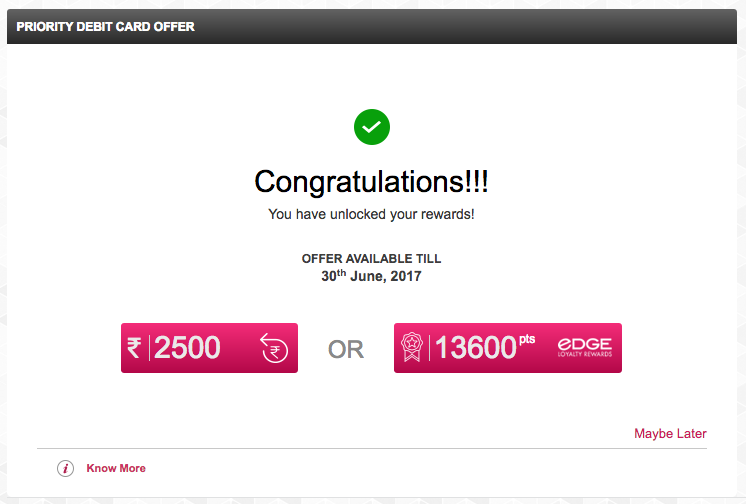 It mentioned 2 options sms back cashback or redeem points, will update if cashback falls in account. fingers crossed. I too got the same message on nov 1. Till now the cashback is not credited. I have escalated it and today they say, I will get that in 5 working days. I have got the Apr-Jun i.e.,Q1 cashback yesterday. They didn’t consider wallet fillings in this . Finally got the cashback for April-June quarter! Wallet transactions on Mobikwik were excluded, though amount was not large so it didn’t matter. Had no Paytm transactions during the period. So basically you need to spend Rs.25,000 online in a span of 4 months to avail a maximum cashback of Rs. 2500, considering 4 quarters in a year, that’s about Rs.10,000 in savings just for using a DEBIT card. Sir, where I can see deposited points earned through Axis priority card? Login to your axis bank account. Click snapshot and scroll down a bit to see “Get rewarded for spending! banner in the middle. Yes, Indeed it’s been extended. I have a Salary priority A/C with Axis so exempt from maintaining AQB/AMB of 2L. 12.5 K INR of free money so far received from Axis bank just to put money into PhonePe wallet and download it a few seconds later 4 times a year. What do you mean by downloading it few seconds later? Do you have an option of transferring the wallet money back to account or what? looks like they have removed all the wallet transactions, even if they are bill payments. so as of now it is only ola money and amazon . @harshit – I did a txn on 10-Jan on phonepe and although it took a week to recognize this, it did eventually clocked as an online spend. yesterday I tried phonepe and it is considered as valid online transaction. I used phonepe and paid airtel broadband bill via debitcard. I didn’t topup the wallet. Now this is worse. Mobikwik,Paytm,FreeCharge aren’t considered as online payment, even if we pay bills via those gateways(I mean, without adding to the wallet). How to avail the cashback. I spend the minimum amount in last quarter where i can get cashback on netbanking page? But that is showing for the current quarter only. How can I unlock for the previous quarter ? Are spends on Amazon still included in the offer (shopping or recharges)? They are not wallet loadings but actual purchases, and are not showing up as recorded for 1 week. Yes. Amazon spends are considered. Recently when Amazon had 250 cashback for Amazon Wallet load of 5000 INR, I loaded it using Axis Priority debit card and it is considered. I think it would be the same with flipkart too. Thinking about opening an Axis priority account. Is this offer still valid? Also what is the current minimum salary credit requirement or AMB requirement to open a priority account? I got the cashback for last quarter. Somehow i couldnt figure out the maths and didnt use the card for 1 year 😯. Too much concentration on using credit cards, but now cred app is helping in geting the cashback. I have normal axis savings account. Should i upgrade to priority account and get priority debit card? Is 10% cashback offer still running? I am getting Rs750 cashback every month apart from Rs2500 per quarter. The best debit card i must say and priority savings account. how r u getting 750rs cashback? Its corporate priority saving account cashback…..1% capped to Rs750 per month. I’ll soon visit branch to apply for the upgrade to priority account. When you received this card? Any seperate activation for this ? Would be interested in knowing how additional 750 cashback can be redeemed. Never received for myself, only the 10% cashback per quarter offer I have been able to redeem. Mines is also priority savings salary account. I get the 10% quarterly cashback, but not this 750rs. Firstly, the criteria to get this 1% cashback (Max up to 750/- in a month) is to have a Priority Salary account(not just savings account). Transact as usual with your Priority Debit card(online/offline). Cashback for a particular months transaction will be available for redemption by 15th-16th of next month. Also you need to transaction for a minimum of 15000/- every month to be eligible for this. My account type shows “Savings”. When I followed the path shown by you, it shows “Sorry Cashback is not avilable for your account”. Will talk to my RM, as he says that mines is a salary account. is amazon working ie i loaded 1000 to wallet and 1000 as gift card . no ecom before transaction. so i guess it is not working? Wait for 3 days and check your axis account. If it is valid, it will be reflected. If not then they might have removed it.